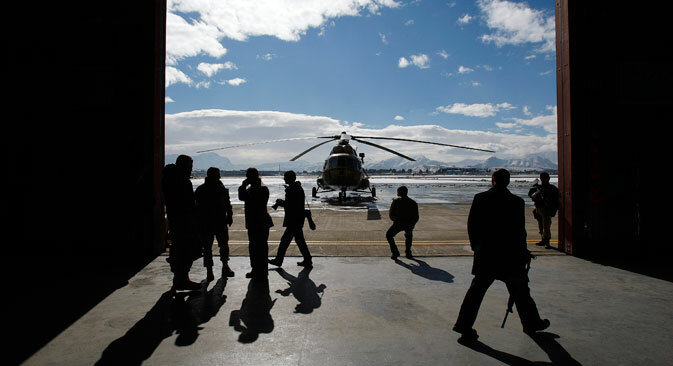 A refurbished newly arrived MI-17 helicopter is parked at the military airport in Kabul January 17, 2008. Restrictions canceled on technical maintenance of Mi-17 helicopters. The United States has lifted the sanctions imposed on the technical maintenance performed by Russian arms exporter Rosoboronexport on multipurpose Mi-17B-5s helicopters, which were formerly supplied to the U.S. to be transferred as military aid to Afghan security forces. The decision was published in the U.S. Federal Register. The document states that restrictions will be lifted on the acquisition and supply of spare parts, as well as on performing corresponding maintenance work. The decision will be valid for two years after the document is signed, unless the Secretary of State changes the term beforehand. The decision also does not affect the contracts, products or services that the U.S. placed under sanctions on Sept. 2, 2015. "It is very likely that Afghanistan exercised some pressure on the U.S. in this case. The Afghans need helicopters and maintenance service, not sanctions," explained Editor-in-Chief of the Voenno-Promyshlennyi Kurier newspaper and retired colonel Mikhail Khodarenok. Two contracts for the supply of Mi-17 helicopters (33 and 30 units respectively) were fulfilled between 2011 and 2014. The American government was unhappy about the purchases of Russian military technology and the large volumes of the orders. The Pentagon was accused of investing in the defense industry of a potential enemy instead of ordering from American producers. Instead of the Russian machines the American helicopter lobby suggested supplying Afghanistan with Chinook heavy transport helicopters. However, in the end the Pentagon chose the Russian helicopters, since Afghan pilots and technicians have been used to this model for 30 years and a change in helicopter would have led to big problems in using the fleet, as well as to frequent accidents. "In Afghanistan's difficult climactic conditions the Mi-17s are irreplaceable," asserts Vadim Ligai, Director of the Kazan Aviation Construction Factory, which produces the Mi-17s. It is not excluded that supplying Afghanistan with the Mi-17B5s will become a window for Russia in the Afghan weapons market, in which the U.S. previously had a monopoly on weapons supplies. According to the French defense and strategy newsletter www.ttu.fr , Russia will supply Afghanistan with 10,000 Kalashnikov automatic rifles before the end of 2015. Kabul has placed an official order.